China has built a giant experimental radio antenna on a piece of land almost five times the size of New York City, according to researchers involved in the highly controversial project. The Chinese government, however, has played down the importance of the facility, which occupies some 3,700 sq km (1,400 square miles) of land, in information released to the public. The antenna would emit ELF signals with a frequency of between 0.1 to 300 hertz, the researchers said. Project WEM’s main surface structure is a pair of high voltage power supply lines stretching from north to south, east to west on steel lattice towers, which form a cross that is 60km (37 miles) wide and 80km to 100km (50 to 62 miles) long. The radio pulses not only pass through the atmosphere, but travel through the Earth’s crust as well, with a range of up to 3,500km (almost 2,200 miles), according to the project scientists. Chen Xiaobin, a researcher with the Institute of Geology, China Earthquake Administration, who has been working on the project, said he did not know its exact location because that information needed a high level of security clearance. “This facility will have important military uses if a war breaks out … Though I am involved in the project, I have no idea where it is. It should be up and running by now,” he said. Lu Jianxun, the chief scientist on the project, also leads a key communication programme at the PLA Naval Command, according to information on Chinese government websites. The construction work was led by 724 Research Institute under the China Shipbuilding Industry Corporation, which is a major supplier of communications and electronic warfare equipment to the Chinese navy. Hu Wenmin, president of the corporation, visited the emission site in May last year, according to a statement on the state-owned company’s website. Hu “expressed his appreciation for the construction of the WEM project and put forward opinions and requirements for the follow-up development of the project and the technical application in related fields”, the statement said. Chen declined to comment on the impact the facility would have on residents’ health. But some researchers said that China’s environmental authorities have concerns about the project. The Ministry of Ecology and Environment, for instance, asked for a comprehensive review on its environmental impact – a request that has not been granted. “The money came from civilian budgets, but the military has intervened and muted the ministry’s complaint,” said a Beijing-based researcher, who asked not to be named due to the sensitivity of the issue. According to one calculation by the Chinese navy, a person standing on the emission site would be subject to ELF radiation no greater than 10 watts, enough to power up several LED light bulbs. But Qiao Fengshou, a researcher with the navy’s Ship Communication Research Institute in Wuhan, who made the estimate, said there was nothing to worry about. 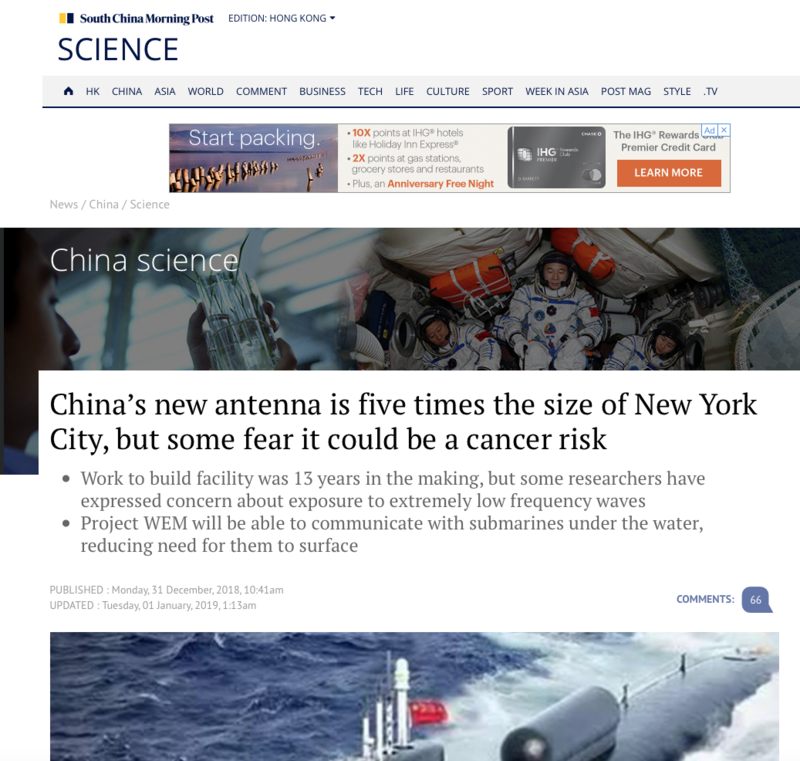 According to China’s safety standards, only radiation greater than 300 watts is considered harmful, so the project will cause “no harm to staff and residents in surrounding areas, it is not necessary to build extra facilities for the purpose of health protection”, Qiao wrote in an article in the Chinese-language research journal Ship Science and Technology in 2016. Qiao also said that the project would be given an “exemption from supervision” by the environmental authorities. Xi Jilou, a researcher with the Institute of Earthquake Forecasting who was not directly involved in the project but informed about it, said that relevant authorities had recently conducted final checks on the emission site and concluded it was ready for operation. “There should be some devices monitoring the environment on the site for the protection of public health,” Xi said. The Zevs antenna was powered by two 60km electric lines and had a main frequency turned at 82 hertz. The radio waves it produced were believed powerful enough to reach Russian nuclear submarines hidden deep under the Arctic ice cap. Russia has since provided technical support to China as it started building its own systems, which may include other ELF stations in coastal areas. According to the WHO, an ELF field can affect human nerve fibres and stimulate synaptic transmissions in neural networks. It can also affect retina cells, generating a sporadic flash of light in people’s eyes. Animals can use low frequency signals to detect threats or changes in surrounding environments, an ability critical for survival in nature, according to some biologists, and experiments suggest that ELF radiation could also have an effect on cattle. Huang Zhiwei, a professor with the department of electrical engineering at Nanhua University in Hengyang, Hunan, said the ELF radio was unlikely to cause acute damage to the human body due to its enormous wavelength, which could stretch over thousands of kilometres, but it might interfere with the sensory organs. “If the frequency caused a resonance with our sensors it could be a nightmare,” said Huang, who was concerned because he and his family live in the region. Some previous studies had shown that wounds healed more slowly when exposed to ELF radio waves several times a day, Huang added. Huang, who has taken part in numerous military research projects, said the environmental impact of defence-related facilities was usually not scrutinised as much as civilian projects. “The matter must be handled with extreme caution, or it can easily lead to public panic,” he said. Huang said the authorities in charge of the WEM project should recruit a large number of volunteers for comparison studies. The sample size must be sufficiently large because of variations in environment and timing or the individuals involved could produce different results. “Some people are more sensitive. They can see or hear things other people can’t. They may be more vulnerable to the impact,” Huang said. Researchers also said that the facility would also have a peacetime application and be used to detect mineral and oil deposits. Ground stations with special equipment can pick up signals to survey underground structures to an unprecedented depth. The ELF waves will also be able to detect rock deformations, which could help in studying precursors for major earthquakes. In 2013, China’s state media reported that the PLA Navy had completed the development of the world’s most powerful and sensitivity low-frequency communication system for nuclear submarines. The reports described the technology as having the world’s largest communication distance and deepest communication depth, according to the official report. The US Navy shut down its Wisconsin transmitter in 2004, saying it no longer needed to rely on ELF radio. Instead, US nuclear submarine fleets use very low frequency or VLF radio waves, with a frequency ranging from 3 to 30 kilohertz, for long-distance communication. The VLF radio waves can carry more information than ELF signals because of this higher frequency, and can penetrate seawater to a depth of up to 40 metres (130 feet). Thanks to BF for sharing this link with us @ Z5G!